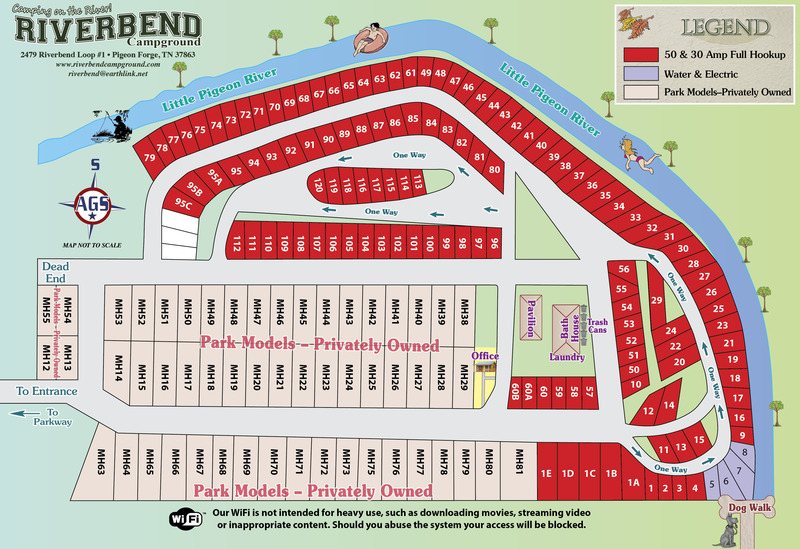 Ask fellow campers about "Riverbend Campground" and nearby attractions. Very nice park. Lots of pretty back in sites along river. We reserved a pull thru but couldn't get on site because of trees and tight turn- moved us to better site. Everything worked fine. Great WiFi. We camped at Riverbend Campground in a Fifth Wheel. Nice park was here with a COA group. we had a backin to river. nice site #45. We camped at Riverbend Campground in a Motorhome. We enjoyed our stay here, very quiet this weekend. We had a pull through slot but would prefer a river site when we return. Easy in and easy out for my 36 ft 5th wheel. The turn at light coming out of Pigeon Forge can be tricky and tight with heavy traffic. The bathroom was not elaborate but very clean and well kept. We camped at Riverbend Campground in a Fifth Wheel. Sites by river are the most private and plenty of room in back for fire and sitting out. Good proximity to Pigeon Forge and area attractions. Christian owned and operated. Nice clean park. Great location to area attractions. Level sites. This is the best park I have found so far in the area. We camped at Riverbend Campground in a Travel Trailer. Exceptionally friendly staff. Very tight navigation, and the sites are tight as well. Better signage is needed. The WiFi was quirky to non existent. We camped at Riverbend Campground in a Motorhome. Lots to do in the area. Goats on the Roof was fun. The drive to Cades Cove was beautiful. Visited Smoky Mountain Knife Works. Walking distance to some good entertainment and restaurants. Level concrete sites, FHU, some along the river, most with some shade and grass, free cable television and good wifi. Picnic table and fire ring, clean basic restrooms and laundry. We camped at Riverbend Campground in a Motorhome. Nice place. Right on the river. But sites close together. We camped at Riverbend Campground in a Travel Trailer. Nice clean quiet park. Near the action, but no road noise. Nice size spaces. We had a back in, but there are some pull throughs available. Cable tv, but some sites are open to the sky for sat reception. We camped at Riverbend Campground in a Motorhome. Great Smokey Mountains national park. Dollywood. Many good supper theaters. Plenty of rides, for the kids, go karts, mini golf etc. We couldn't get into the park we usually patronize, but we're so glad, because we really liked Riverbend Campground. The location is almost perfect for Pigeon Forge, close to everything we wanted...easy access and exit with a stop-light...beats trying to dodge death getting out of some campgrounds! Most of their sites and roads are paved. Pretty good WiFi. Management is more than accommodating, and if you're a gospel music fan, you'll like the in-park singings every week. We feel like we've found a new home at Riverbend when we head for Pigeon Forge. We camped at Riverbend Campground in a Motorhome. This place is better than a 10, first the bathroom shower area is like nothing else piano music plays when you open door granite everything amazing. Game room above for children. Sites are big level and shaded. Motorcycle riding is wonderful up there. Campground manager is right there if you need anything and cleanliness of pool and sites is top notch. Can't wait to stay there again. We camped at Riverbend Campground in a Travel Trailer. A well-maintained park, slightly off the maindrag. Turn at light #1 in Pigeon Forge. This park is at the back of a mobile home area. However, the long term units are well kept and seem to be older retirees. Lot spacing is very close with a sunny/open exposure. Site surface is gravel and features a fire ring, picnic table and patio. We camped at Riverbend Campground in a Travel Trailer. Had a beautiful back in site on the river with level concrete pad where we could watch the herons fish after a day in the hustle bustle of "Dollywood Land". Right in the heart of everything yet removed and quiet. Bathrooms were older and satisfactory but nothing special. Cable/wifi electric and water were all fine. Good value if you don't need a lot of kiddie amenities or a pool. We would definitely stay again. We camped at Riverbend Campground in a Motorhome. Well there's literally hundreds of things to do and see...but I will recommend seeing the Titanic exhibit & tour. 2 hours long and if you love history and think you already know the story..think again. Not cheap and worth every penny. Park is clean. Right in the center of town, so it's very convenient. Getting a reservation by phone is very frustrating if you get the person who doesn't speak very good English. (He's a very nice man, but should not be allowed to take reservations). Park has no pool, but is on a creek. We stay here often. The staff is very friendly and the location of the park is great. We camped at Riverbend Campground in a Fifth Wheel. Pigeon Forge has tons of shopping! 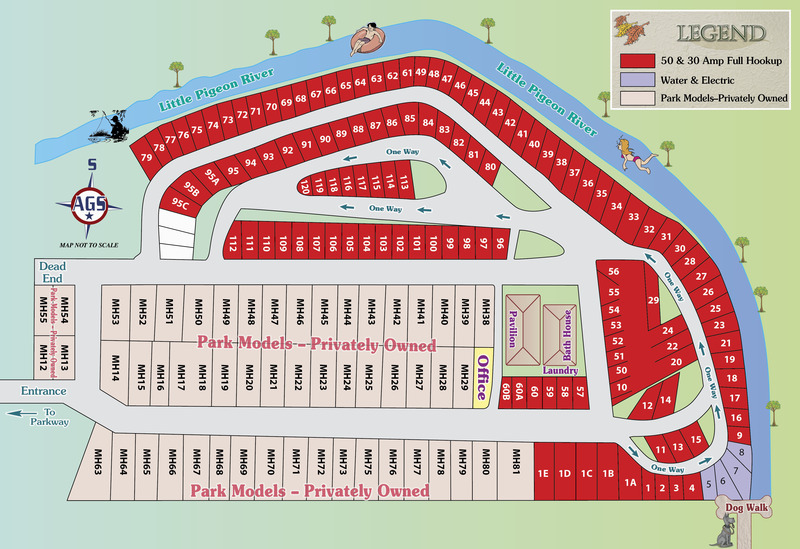 The RV park is in an excellent location for visiting the Pigeon Forge area. There is no pool or playground in the park. The cable TV and Wi-Fi worked well. Many of the sites, but not all, have a concrete pad. The restrooms were clean and the staff was friendly. 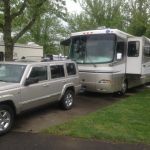 We camped at Riverbend Campground in a Fifth Wheel. We stayed here while attending a concert at Dollywood. This is a quiet, nice enough park. Riverside sites are nice, although a bit tight. Sites are situated mostly perpendicular to the road which makes a little challenging for backing in a big rig. Bathrooms and showers are "OK", nothing special. I gathered that they cleaned the restrooms and emptied trash once every 2-3 days. This facility hosts many gospel events and rallies, and they have a church service at the pavilion on Sunday morning. The staff we encountered were polite and helpful. Based on other options in Pigeon Forge, we would stay here again. We camped at Riverbend Campground in a Motorhome. 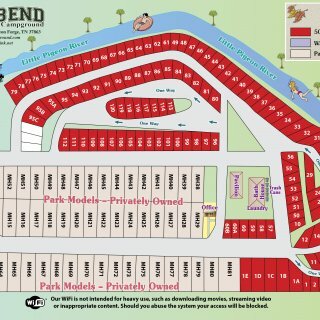 Are you affiliated with Riverbend Campground ?